Today we arrived in Greece for my second annual Mustaine Writers Retreat! I took 7 songwriters on an out-of-this-world experience to Syros, Greece. Some of the writers have never even been out of the country and I'm so glad they all get to share this experience together. The writers flew in from all over the world for this event! Four writers, including myself, came from Nashville, and the rest came from Los Angeles, Denmark, and England. I have to say, it's really special so see people from all over the world come together over a common interest like music because making music is such an intimate and vulnerable experience, I feel instantly closer to someone that I've written songs with. Getting to do all of this together, overlooking or learning to break down any cultural barriers, is so beautiful to witness. 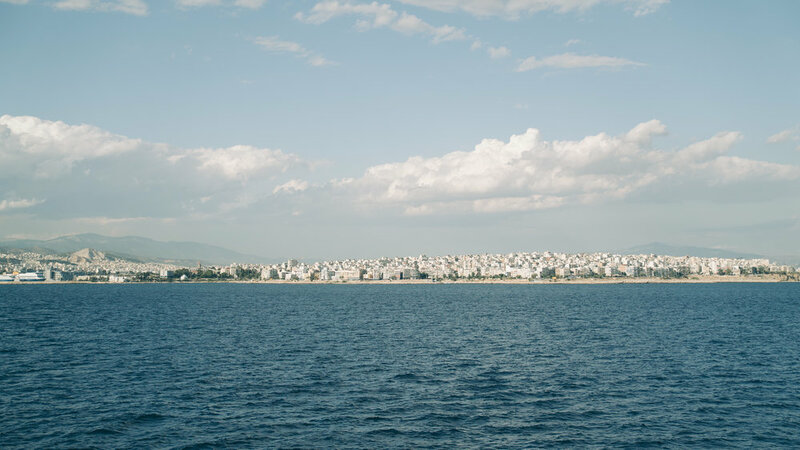 We landed in Athens, met up with all the other writers and hoped in a van to the port of Piraeus to catch the Ferry to the island. We were staying on Syros which is in the center of all of the islands, and is the capital of the Kikladhes. Getting on the ferry was probably the first glimpse at Greek culture the writers had this trip. All sorts of people came off the boat, some with chickens and other livestock, others with beautiful island tans. Even when all of the trucks from under the boat were being unloaded, it was amazing to watch the hustle and angst of the Greek people. I saw the cutest little elderly couple get off the boat and walk right in between the huge semi trucks, they did not even bat an eyelash at the fact that all of these trucks were moving around them and they could have easily been run over. I loved that they literally did not give a ... you know. We all settled in on the ferry, then decided to explore a little, and made our way to the bow of the ship. The sea breeze felt incredible! It was warm, sunny, beautiful, and the wind was making a beautiful mess of our hair. We decided to stay up here for the next four hours. It was actually really funny because I'm pretty sure all of the Greek people on board thought we were out of our minds. We were doing yoga, a sad excuse of interpretive dance, I believe there was even a Jack & Rose titanic impression somewhere in there too. Needless to say, we were all definitely excited to be there! Haha. When we made it to the port of Syros we were greeted by our soon to be new friend, George. He owned a restaurant on the island and we were famished so he brought a ton of fresh greek food up to the villa for all of us to enjoy before we went to bed, which didn't happen for hours. When we got to the villa-- the locals call it "The Big House"-- all of our jaws dropped. The whole thing was white-washed top to bottom with, of course, accents of blue and grey. Totally Greek island vibes. Yes! We were beachfront, three floors up, and greeted by five adorable kittens. Sign me up! For the writers that had never been out of the country, they hadn't experienced jet-lag like this before either. I stayed up with them, we drank some tea, and played 'the accent game' which was hilarious because there were a few different types of accents around the table already. It's 2:00 AM now, and we are all finally in our rooms, about to get some shut eye before our first write tomorrow morning. Can't wait to see this place in the daytime. Goodnight from Syros, Greece!